Adjustable Transfer Bench from Maddak is a height adjustable shower bench made of durable plastic that supports up-to 350 lbs. It has removable arms and backrest. The transfer bunch provides easier access for people who have difficulty getting in and out of the shower. The Maddak Height Adjustable Transfer Bench has legs that easily adjust from 16-21”. It has a removable back and arms and a built-in hand held show holder. Suction feet help hold the seat in place. The Maddak Transfer Bench is easy to assemble and requires no tools. It is durable and rust proof and has a maximum weight capacity of 350 lbs. The bench has an overall width of 30". 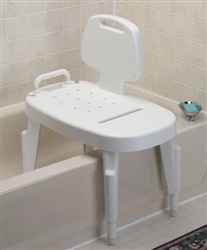 Height adjustable bath transfer bench - 16"-21"
After my mom's first fall in the bath tub prompted me to find a device to prevent that from another occurrence. Very happy with the product - fitted strange bathtubs in Europe where my mother resides - awesome!! !